Our back country roads were so hazardous. Whats the best way to spend it????? Gingerbread muffins with Streusel topping. A house full of teenaged boys means they won’t last long. The best part is…..they’re vegan. I’ve been having lot’s of luck veganizing recipes lately. Tonight we are having whole wheat pizza with D.H.’s homemade pesto, mushrooms, onions, peppers and olives. Right now Alex is registering for his college classes with the help of his Dad. It won’t be long then they’ll be all grown up 😦 So thankful to have had this extra time off with my little family. I had myself a lovely day selecting a ton of Valentiny goodies for some awesome Creativity Kits. I do tend to go a bit overboard : ) When I had all the supplies worked out…I wrapped them up in a super sweet pink striped Middi Bag and tied them up with yummy pink string and a heart punched tag! You know I had to work in some awesome trims from Really Reasonable Ribbon. These have to be the cutest wrapped kits I have ever made : ) I even punched a heart in the tag and tied it up with pretty pink string. That’s 65 pieces of crafty goodness. I’ve got these kits listed on Etsy. Click on the link to get the details and pick up a Creativity Kit for yourself. And the other good news….they qualify for or special Valentine gift with purchase promotion…..you’ll get a set of Valentine tags to add to a gift, label a home baked treat, write some sweet nothings to your someone special, or tuck an ” I’m thinking of you” to your kiddos pack lunch : ) Check out the details in the header to our Etsy shop. 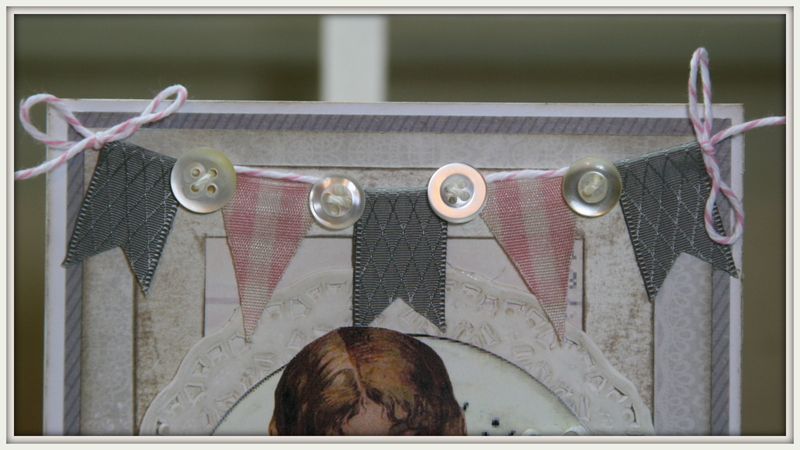 Well today is my day over at Really Reasonable Ribbon to share a tutorial : ) I just love creating fun embellishments with those trims! 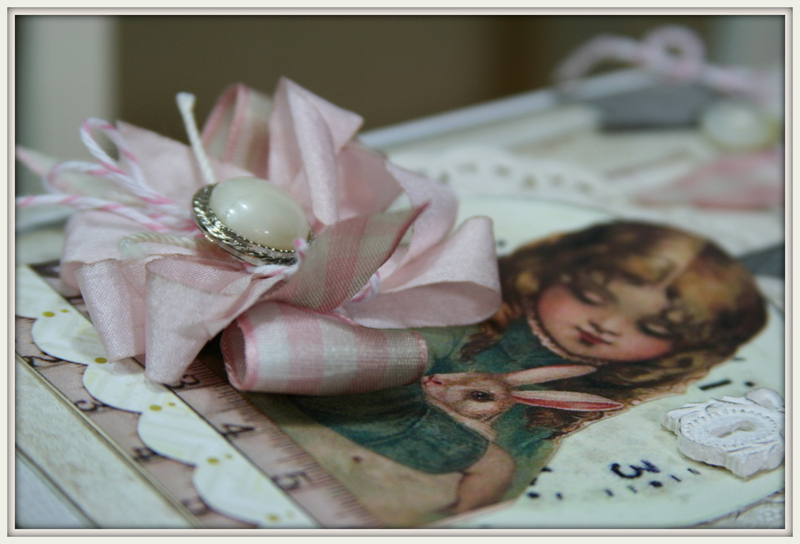 I’ve used this beautiful image from Graphic’s Fairy before…but I’ve never paired her with pink. I kinda love it! Cotton Candy. As you can see…I’ve inked the ribbons to make them extra shabby. All the little pieces of this banner were easy to slide right into place to get the perfect spacing. I topped it off with some vintagy butons. In my humble opinion…..a bow can never be too poofy! See I told ya it was easy. And man do they go together in a snap. Next time I’m going to try layering the ribbon banner over a paper banner. 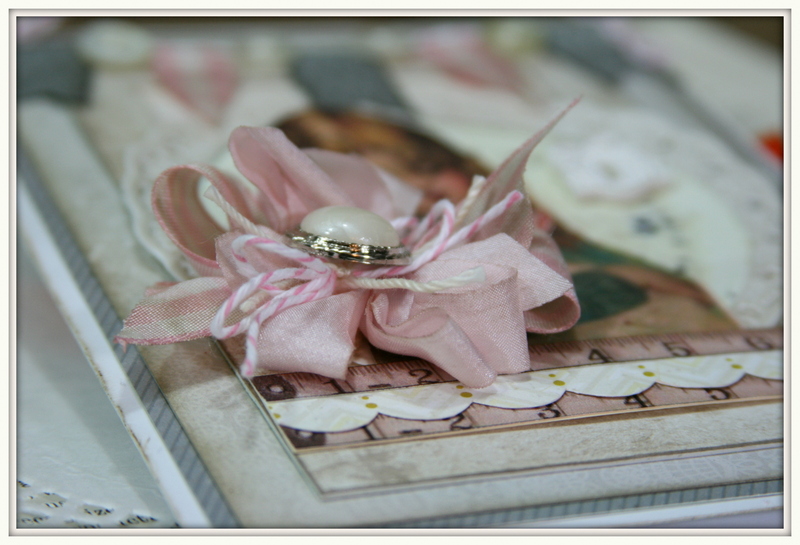 By the way….there are lot’s of great ribbon tutorials posted from the talented designers at Really Reasonable Ribbon’s Ramblings…..why not hop over and check em out? Not too much time for a post today…but I wanted to share with you a sweet little New House Mini that I created last week. See I told ya it would be a quick post : ) I should mention that most of this awesome paper is from on of my favorite brands…Lily Bee. Very retro and chipper and cheerful. To hide the clips holding my Valentine heart to the little hanger I added some poofy bows with my Really Reasonable Ribbon Pink Wrinkle Ribbon and Cotton Candy Bakers Twine. Well that’s it for me today…gotta get ready to head to the shop. It’s still bitterly cold here so I’ll be enjoying shutting myself in to create more projects and dreaming of Summer. The chipboard frame looks a lot like an old painted dock or pier. Especially with the shabby look of all the other layers. I worked in a generous strip of Ivory Jute Ribbon from Really Reasonable Ribbon…..the Chocolate Brown Seam Binding and Jute Natural Ribbon on the rings is too. I love the textural and natural look it adds. I even added a bit of the Jute Ribbon to fluff up the flower arrangement. Flowers on masculine projects can be such a challenge. Oh and I also talked myself into opening a package of Ideology pins to give the arrangement a little height with the tiny blue star. Each set of pages has more of the netting, and inked chipboard and a beach themed sticker. The page on the right has room for nice large pictures and a vintage inspired tab. The left page has 2 large pockets for pics and mementos and 1 large journaling tag. I love love love those chipboard pieces. This set of pages shows the journal tag in the back pocket. You can really add ton’s of goodies to this type of mini. I made the pages super sturdy and thick so it will hold up to lot’s of showing off. So maybe this will keep me out of the new stock for a little while. Nah. Nearing a blog milestone here at Polly’s Paper. We will very soon be at our 600th subscriber. Yayyyy!!! Trying to think of what would make a nice giveaway gift for a contest when we get there. Anybody have any good ideas? 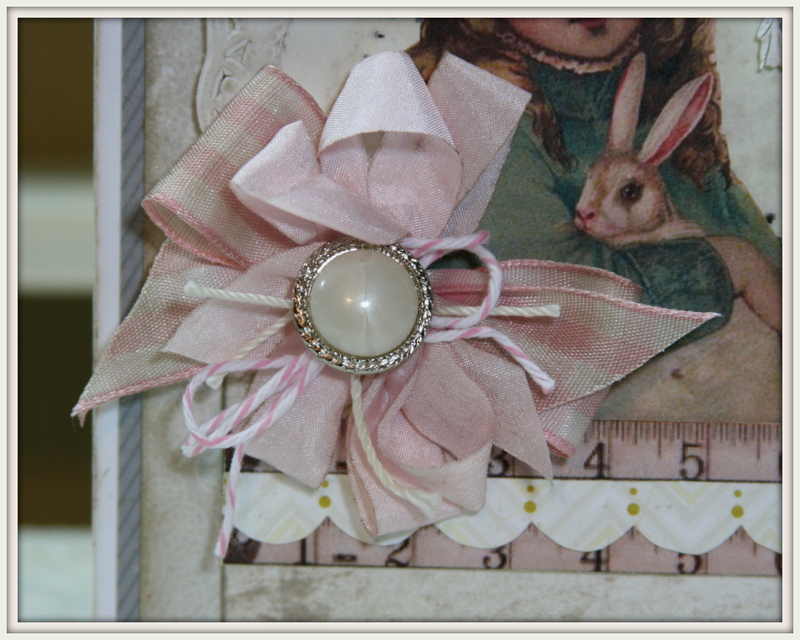 Here’s another sweet little Valentiny greeting card I created using items from my scrap and salvage box and trims from Really Reasonable Ribbon. 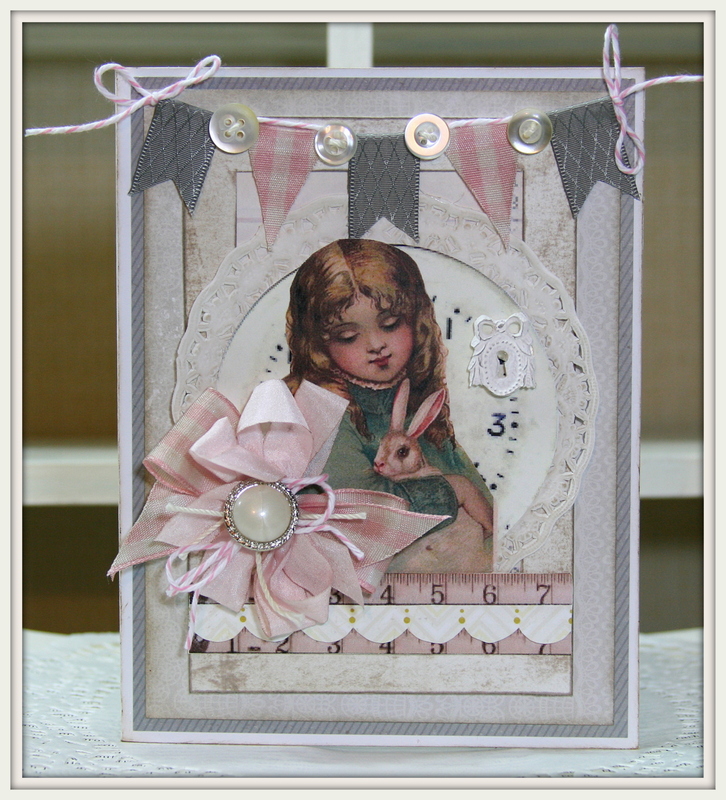 Jenni Bowlin papers and house die cut are layered with vintage images, inked doily and craft tags. The red paper rose was painted to lighten the color and an unexpected surprise was this awesome texture. I used Red Wrinkle Ribbon and berries and a generous length of Cherry Bakers Twine. The two glittery chipboard hearts are super sweet on the little house.